With the weather turning warmer and summer travel season around the corner, many Americans will be hitting the road. Before you head out with your family in tow, you may want to consider these six tech products that can keep you safe and get you back on the road quickly if you have problems out on the highways. And while you're at it, load up on our essential apps to use on the road. Getting a flat tire on a dark road with no flashlight is no one’s idea of fun. The Eton Road Torq is a self-powered LED spotlight that provides plenty of light, without the need for batteries. The Road Torq is powered by a dynamo hand crank — two-minutes of cranking give you 15 minutes of power. It also features a flashing emergency beacon to warn passing motorists. 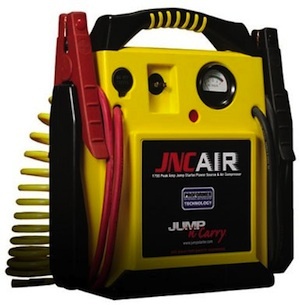 The Jump-N-Carry gives you not only a portable battery that can jump start your car multiple times per charge, but also an air compressor that can inflate your tires. This could be a lifesaver if you break down in an area with spotty phone service. Changing a flat tire is messy, difficult and can be downright dangerous. 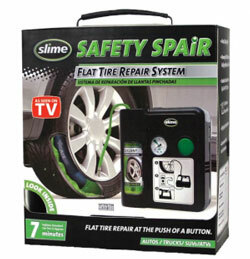 With just the push of a button, the Slime Safety Spair injects a special sealant into your tire, plugging punctures up to a quarter inch, and quickly re-inflates the tire with its built-in compressor. All in 7 minutes…er…flat. There’s also a safety light for night use. The last thing you want to discover when your car battery is dead is that your cell phone is dead too. 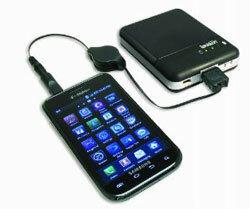 You’ll never run out of juice for your cell phone with this AA-powered charger. The charger comes with a retractable USB cable and seven adapter tips, as well as a standard USB jack to use the cable that came with your phone. 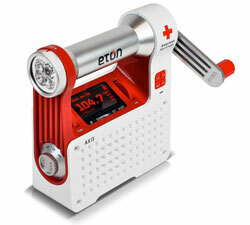 The Eton ARCPT300W American Red Cross Axis Self-Powered Safety Hub is packed with features that will come in handy during an emergency. There’s a NOAA weatherband radio for tracking bad weather conditions, a flashlight, a red blinker for alerting others to your plight, as well as an AM/FM radio for general news. 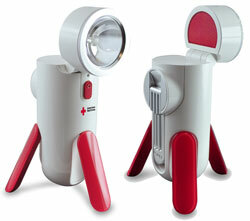 You can use its built-in hand crank to power the device, charge its internal NiMH battery or pop in three AAA batteries. If you frequently drive in wilderness areas, the Spot Connect can literally be a lifesaver in an emergency. Spot Connect provides a satellite link for sending out an SOS call with your GPS location to the GEOS International Emergency Response Coordination Center (IERCC). The IERCC then alerts the appropriate emergency responders wherever you are — in North America or Europe. You can also use the satellite link to send text messages and email. 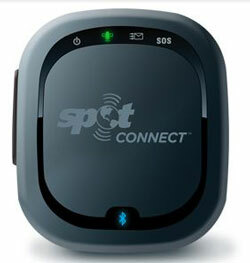 Price: $136.97 on Amazon or $169.00 at FindMeSpot.com, plus a $99.99 yearly subscription. The price for the cobra Jumpack is $129 not $29. Gadgets are great to have in your car should any emergency… emerges. The one service you should never be without is membership with an automotive service such as AAA. Not for nothing they have been around for over 100 years, having AAA in your wallet insures you, not the vehicle, thus providing roadside assistance to any vehicle you happen to be in. In addition, having this membership includes emergency trip insurance that will cover for incidentals should you be stuck with a broken car in the middle of your vacation or trip. You also get discounts to hotels, car rentals, pharmaceuticals, ticket prices and more. There is no traveler service out there that does not offer a AAA discount so for a small yearly fee AAA membership should be in your wallet weather you are a driver or not. If you travel, you need AAA. I suggest adding one more item to the list: the CarMD tester (http://www.carmd.com/71.6/Article/What-Does-CarMD-Test?). It’s a battery–operated, portable device that is invaluable when the “Check Engine” light comes on during a drive, because it can quickly and easily identify the reason — which may be as minor as a loose gas cap. There are ancillary benefits, too, such as identifying problems that may cause the vehicle to fail an emissions inspection. It's available on Amazon, too. I gather you own shares or receiving monies for the Amazon advertising. At the time of writing an article, we identify the product distributor we believe is offering the best combination of price and service for each product, and provide a link to that store next to the product. Techlicious receives a affiliate fee from some (including Amazon), but not all, of the “click-thru to buy” links contained on article pages. These click-thru links are only determined after the article has been written and recommended stores are not chosen based on commissions. Likewise, affiliate fees in no way impact the price you pay when purchasing the product. We do not own stock in Amazon nor is Amazon a current advertiser on Techlicious. However, Amazon frequently has the best price available, which is why their links appear with the most frequency in our stories.